This partially ruined castle near Oban sits on a large rock and is surrounded on three sides by the sea. 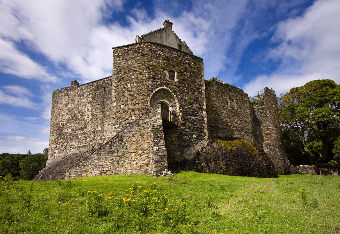 Dating back to the 13th century it is one of Scotland’s oldest stone castles. Along with it’s exceptional architectural refinement the castle has a wealth of history to match. The castle was built at the height of the battle between Scotland and Norway by the MacDougall lords of Lorn and has been held since the 15th century by the Clan Campbell. It was even once besieged by Robert the Bruce during the Wars of Independence. The castle is maintained by Historic Scotland and is open to the public , although the 16th century gatehouse is private property.